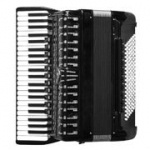 On this French site you can find free scores for accordion. Scores are with audio (pdf + mp3). Many music genres including: polkas, marches, waltzes, mazurkas and more (even samba, tango or twist). If you are looking for easy accordion lead sheets (melody lines with chords) for free then you should check this page. All lead sheets are with concertina tabs, so if you use them for the piano accordion then just ignore all numbers above the staves.